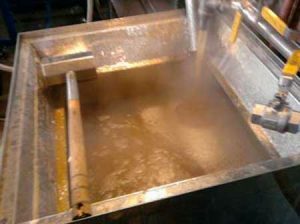 Sterling Ridge Resort has produced 95,000 GALLONS of sap this year from our Sugarbush. What is a sugarbush? A sugarbush is a group of sugar maple trees growing in the same area and used to produce maple products. The Ridge has 3000 trees tapped for this purpose. We will be packaging pints and quarts of our own Maple Syrup for you to purchase when you visit us! Dissolve the yeast in the warm water and maple syrup. Leave alone for a few minutes. When frothy, add oil, salt and 2 c. flour; beat well. Add dry milk and wheat germ, and mix in. Then, add 2 – 3 c. more flour, a little at a time. Knead about 10 minutes. Let rise until double. Punch down; roll dough to about 1/4 – 1/2″ thick. Spread some soft butter on the dough and sprinkle with 1/2 c. maple sugar or maple sprinkles. Roll up like a jelly roll. Slice into slices about 1″ thick. In an 8 or 9″ pan, melt about 1 tbsp. butter; add 3/4 c. medium or dark maple syrup and 1 c. chopped nuts. Arrange slices in the pan; rise again, then bake at 375 degrees.